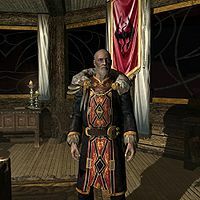 Emperor Titus Mede II is the current Emperor of Tamriel at the time Skyrim takes place. He is an aged, wise and powerful man, who is forced into visiting Skyrim by the Dark Brotherhood, upon the command of Amaund Motierre. When you enter his cabin, Mede seems to have accepted his fate, but he asks you to kill the man who ordered his death. Titus Mede II's reign includes the Great War and the signing the White-Gold Concordat ending the war. He is also a talented tactician, and was an integral part of defeating the occupying Thalmor forces in the Battle of the Red Ring. He wears a set of Emperor's robes along with a pair of fine boots. He carries a Katariah master key. Upon entering his chamber in the Katariah, even if you are invisible or sneaking, he will acknowledge you by saying: "And, once more, I prove Commander Maro the fool. I told him you can't stop the Dark Brotherhood. Never could." He will then initiate conversation with you, saying: "Come now, don't be shy. You haven't come this far just to stand there gawking." You were... expecting me? "But of course. You and I have a date with destiny. But so it is with assassins and emperors, hmm? Yes, I must die. And you must deliver the blow. It is simply the way it is. But I wonder... would you suffer an old man a few more words before the deed is done?" Your rule is at an end! Sithis commands it! "Oh, you can save your sinister bravado. I'll not go to my grave whimpering like an infant. I know why you're here. I must die. And you must deliver the blow. It is simply the way it is. But I wonder... would you suffer an old man a few more words before the deed is done?" (Remain silent) "You and I have a date with destiny, it would seem. But so it is with assassins and emperors, hmm? Yes, I must die. And you must deliver the blow. It is simply the way it is. But I wonder... would you suffer an old man a few more words before the deed is done?" I'm listening. "I thank you for your courtesy. You will kill me, and I have accepted that fate. But regardless of your path through life, I sense in you a certain... ambition. So I ask of you a favor. An old man's dying wish. While there are many who would see me dead, there is one who set the machine in motion. This person, whomever he or she may be, must be punished for their treachery. Once you have been rewarded for my assassination, I want you to kill the very person who ordered it. Would you do me this kindness?" I've heard enough. Your life ends now. "Tsk. How unfortunate. I had hoped you would honor an old man's dying wish. Well, let's be done with it then." (Remain silent) "You will hear me out, then? Good. You will kill me, and I have accepted that fate. But regardless of your path through life, I sense in you a certain... ambition. So I ask of you a favor. An old man's dying wish. While there are many who would see me dead, there is one who set the machine in motion. This person, whomever he or she may be, must be punished for their treachery. Once you have been rewarded for my assassination, I want you to kill the very person who ordered it. Would you do me this kindness?" I'll... consider your request. "Thank you. Now, on to the business at hand I suppose, hmm?" A Dark Brotherhood assassin doesn't do... favors. "Hmph. Pity. I had hoped to obtain even a modicum of justice. Well, on to the business at hand then, hmm?" (Remain silent) "Well. Perhaps you'll at least consider it, hmm? Now, on to the business at hand..."
All three of the dialogue options above makes the Emperor exit conversation with you. Talking to the Emperor after he has exited conversation with you will only result in him saying: "Well? I won't fight you, so we may as well get this over with." Somewhat ironically, Titus Mede II's class is Assassin, which determines the level of his skills. He is voiced by Wes Johnson, who voiced the male Imperials in Oblivion. Even if the player is an Imperial Legion member, killing Emperor Titus Mede II has no effect on the progression of the Imperial storyline. However, if you join the Imperial Legion after killing the Emperor, General Tullius will omit his name from the oath he administers to induct you into the legion. Titus, as well as the Penitus Oculatus, will still remain in Skyrim even if you've resolved the Civil War in favor of the Stormcloaks, even though Skyrim is supposed to be an independent nation at that point. However, it is unlikely the Emperor would openly recognize their independence in this case, and was still forced to come to Skyrim by his cousin's murder. The Penitus Oculatus will continue its presence in the game, even after you kill the Emperor, despite the fact that you can overhear Commander Maro saying otherwise before killing him. During To Kill an Empire, Titus sends an almost identical decoy to Solitude in his stead. Emperor Titus Mede II also appears in the Heroes of Skyrim card expansion for Legends. This page was last modified on 11 March 2019, at 19:28.